NEW! 1st edition. 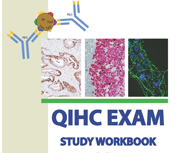 Get ready to take the QIHC(ASCP)qualification exam. Just released, this workbook includes all the information that could be on the test. The workbook begins with a suggested reading list, and covers basic immunology, specimen handling, detection systems, epitope retrieval, staining, and lab operations. Note: This workbook does not contain any actual exam questions. 5th edition. The Study Guide is a workbook containing instruction and exercises formatted to help you prepare for your registry exam. We have expanded the content to remain current with the ASCP Board of Registry HT/HTL exam content guidelines in all areas and now also includes cytopreparation. Topics covered range from standard histology to special procedures, immunology, chemistry and even research and development! This is an invaluable study aide if you are preparing for your registry exam! Is your employee competency documentation lacking? Get help filling the missing piece of the pie with THE MSH COMPETENCY HANDBOOK! This 25-page guide covers the goals and standards necessary to evaluate your employees. It includes helpful advice, guidelines, and information that you can obtain from the CAP, JC, ASCP BOR, NSH, and NAACLS. Also, several styles of forms are included that can be scanned and personalized to your institution’s needs. Orders are batched and shipped roughly every 7-10 days.